2:00 PM Quasi-cease fire in effect. Israel stopping general air raids over Lebanon, acting only in support of ground troops. Rockets fall in Kiryat Shmoneh. 3 soldiers injured when vehicle overturns in S. Lebanon. French Foriegn Minister - "Iran a stablizing force in the region". 2 suspects caught in Haifa, suspected to be their way to perform terrorist attack. I posted a link to this site earlier, but it was in a list of other links worth looking at. We here, at the Muqata, have made an editorial decision to try and raise it's visability. So, check this out. Be warned, there are some very graphic, disturbing images. But, they show the depravity of the enemy we are facing, and it's willingness to make use of civilians. Not only using them as shields, but using the accidental death of children as a propaganda tool. A great run down of the laws of war as regards to the place of civilians. Includes spectacular video of Hizbullah firing Katyusha rockets from Kfar Kana as well as video of launchers being hidden in civilian houses. 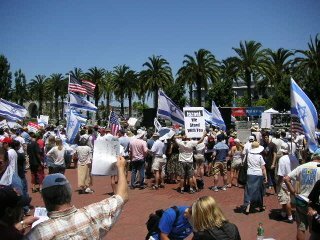 Some excellent posts about Anti-Israel protests around the world. Fighting in Taiybeh leaves 6 soldiers wounded and at least 3 terrorists dead. Doubt begins to form over cause of deaths in Kfar Kana, IDF states that bombing raids occured at Midnight-1 AM, explosion causing civilian casualties around 8 am, possible that secondary explosion of stored arms was the cause. Kasam rocket fired over Negev at around 6 AM, no damage reported. IDF once more calls for non-combatants to move North of Litani. Air Force to reign in activities for next 48 hours. Ground based activities on the rise. 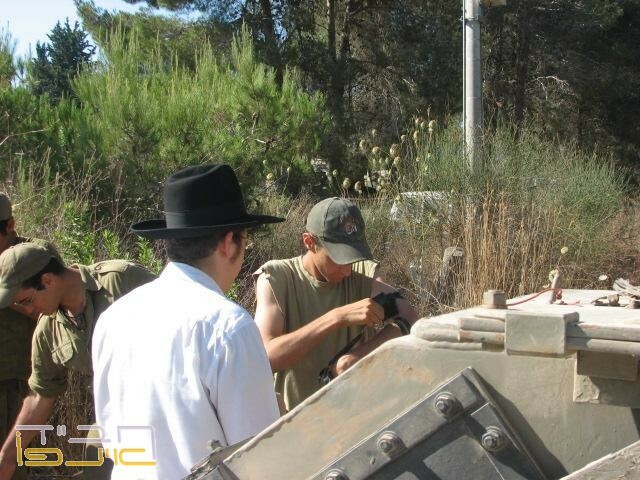 In action in Kfar Adaisah soldiers from Nachal and Engineering corps as well as Tank corps captured large cache of armaments, intelligence material as well as IDF uniforms. Post moved to here. for technical reasons. I have a question. It’s something that has been bothering me for a while. That something just does not compute. Totally lacking logic. Really, I don’t get it. Liberals, Progressives, Lefties. Yeah, you. The folks who believe in the primacy of human rights, the right to a free press, the right to sexual freedom, reproductive rights, environmental rights, etc. etc. You know who I’m talking about. These are all the things you stand for. Oh yeah, minority rights, freedom of religion (or freedom from religion), am I missing anything? I’m sure you all can come up with a few more. One would, if using straight logic, think that given a fight between two groups, one who embraces all of these things whole heartedly and one who found every last item on that list an anathema the logical choice would be to side with those one agreed with. Correct me if my thinking is off here. Yet, it always seems, those enlightened elites, those bastions of liberal right thinking, all seem to support the most backwards primitive crowd in its genocidal war against a left wing liberal democracy. Of course I’m talking about the Arab-Israeli conflict, more specifically the Israeli/Palestinian conflict. On one side you have Israel. Where everything goes, the press is free and so is the love. Women have full rights; heck there’s even been a woman Prime Minister. Homosexuals don’t get stoned in the streets. Young girls aren’t beaten to death because they thought they might go have coffee with the boy down the street. You certainly aren’t strung up if you sell land to a Christian, or a Muslim, or a Buddhist or even a Jew. On the otherside…well, you have Homosexuals stoned in the streets, young girls killed by their own brothers and fathers for falling in love with the wrong fellow, the death penalty for selling land to a Jew. No respect for the environment goes without saying. Corruption, torture, extortion. These are a way of life. Chance after chance, yields nothing but more. It can’t be Israel’s human rights record. There isn’t an Arab country in the world with a better record then Israel. The only difference being, if you report something in Israel it makes the front page and people lose their job and go to jail. In the Arab world, you report something and you lose your job and go to jail. There’s a saying: Just because I’m paranoid, doesn’t mean people aren’t after me. Should we see anti-Semitism under every rock? No, but you certainly make it hard not to. Unfortunately there has been an outbreak of Neo-Nazi comments on this blog, most of them are hiding behind anonymous logins. No more. To comment on the blog you now need a Blogspot account, which requires some accountability. If you aren't willing to at least have a Blogspot account behind your comments, you're not welcome. Additionally I have no problem deleting those comments which do not add to the discussion at hand. Those include anti-Semetic statements and wild conspiracy theories. You may consider this censorship, and you'd be wrong. Censorship is when the government stops you from saying things. This is a private blog, we aren't your soapbox for spewing nonsense. Start your own blog if you feel the need to be heard. If you have reasoned arguments, feel free to voice them without the invective which shows that you aren't interested in a discussion. If you have a problem...feel free to email me at litvshe-at-yahoo-dot-com. experiences this past Friday and Shabbat in Northern Israel. I'm fine...but it was an experience that needs to be blogged and shared. PS: To all the commenters who insist on name calling Jews and Israelis, your comments WILL be deleted, so don't bother anymore. 5:49 PM 3 Katyushas hit Acco. No report of wounded. 4 Kasams in Ofakim, one woman hurt. 4 in Kiryat Bialik. 5:35 PM Where's the outrage! 3 Katyushas fell in Kfar Kana yesterday. Oh...yeah...that Kefar Kana is in Israel, near Nazareth. 5:30 PM 4 Kasam rockets fall on Mivtachim, no injuries, damage to storage area. More then 100 rockets fall in North so far today. 5:23 PM IDF states they have proof areas hit in Kfar Kana were being used by Hizbullah terrorists. Rumors surface that main explosions were from Katyusha stored in buildings. 5:22 PM Counter the propaganda - Australian Herald Sun publishes pictures smuggled out of Lebanon of Hizbullah emplacements in civilian population centers. 4:18 PM Magen David Adom reports 57 treated to day for injuries related to rocket attacks. 3:32 PM The terrorist cell responsible for the murder of of Dr. Yakobi from Yakir has been captured. 2:52 PM One seriously wounded when Katyusha hits house in Kiryat Shmoneh. Update: The wounded individual is a writer for the HaAretz newspaper. 2:32 PM Katyusha in Chatzor, one lightly wounded. 1:45 PM 3 wounded in rocket attack in Kiryat Shmoneh. 1:13 PM One moderately wounded when Kasam falls in factory in Sderot. 11:43 AM 85 rockets so far today. 11:15 AM Terrorist caught in Shchem area with explosive belt, warning level lowered. 11:07 AM 47 Rockets have fallen so far in the North, 10 lightly wounded. Air Force attack in Kfar Kana in Lebanon leaves upto 65 dead. 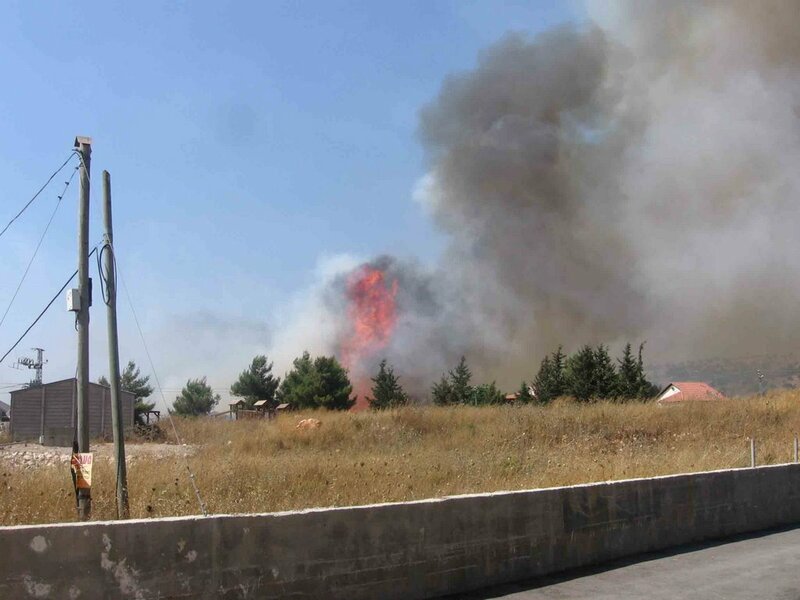 Army spokesman state that area was used as launch site for rockets and ample warning was given for civilians to leave the area, therefore the blame rests upon Hizbullah for using them as human sheilds and the Lebanese Government for not preventing it. Just got off the phone with Jameel. He's back home safely, had a somewhat harrowing Shabbos, but I'm sure he will fill everyone one in with the details including pictures. A very interesting take on the situation by Frank. Would be nice, I'm personally not as optimistic. 9:40 PM Condi claims there will be cease fire by Wednesday. I'd like to know with who? Yisael Beteinu head, Lieberman says any deal that leaves Hizbullah armed is a defeat for Israel. 9:07 PM News round up: More then 90 rockets fall over Shabbos in the North. Dan Chalutz, Army Cheif briefly hostpitalized. 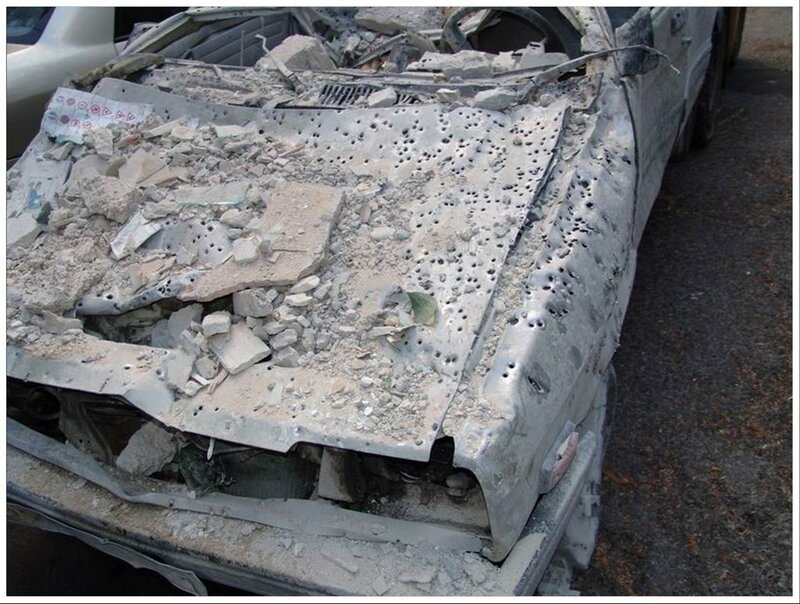 More then 60 targets struck in Lebanon. 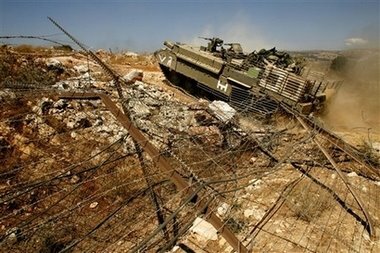 26 terrorists killed in Bint Jabaeil during fighting Friday night, Israel pulls out of town. Rocket fired on Afula not Zilzal, rather Chiiver-1? (or maybe Fajr-5). In foriegn news, attack on Seattle Jewish Center leaves 1 dead, 6 wounded. Not that I'm generally big on polls, public opinion is notoriously fickle, but I thought this was interesting. Most telling is the overwhelmingly numbers that believe that the disengagement from Lebanon and Gaza led to the recent Hezzbolah attack. 64 % agree and 31% disagree that disengagement led to the attack. 5:45 PM 1 seriously wounded, 9 lightly in rocket barrage over Tzfat. Rocket that hit Afula Iranian ZilZal 1 (IDF reports that launcher destroyed in counter strike). Hizbullah commander in charge of weapons smuggling killed by rocket attack on car he was travelling in, along with other terrorists. 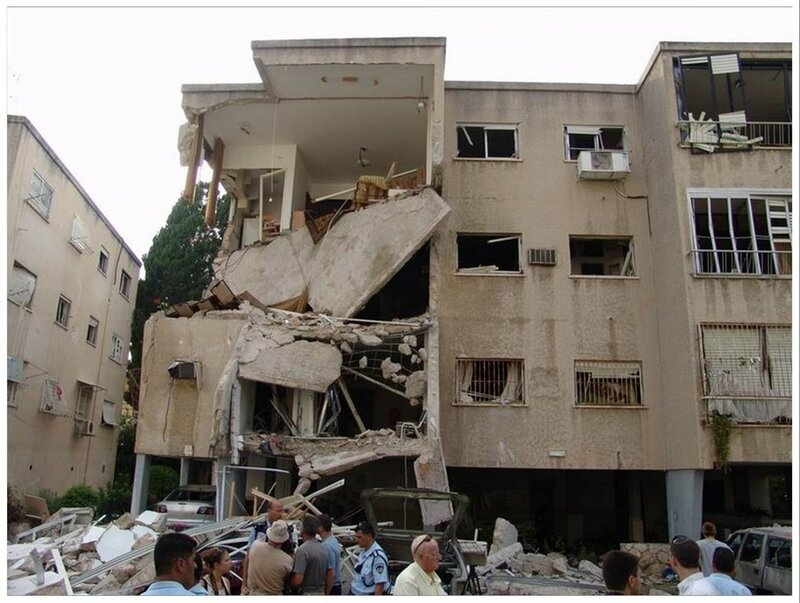 5:20 PM 2 rockets hit hospital in Nahariya, massive damage. New type of rockets seen, fall near Afula. 5:06 PM Several Kasam rockets fell earlier in the day around S'derot. Actions in Saj'ayah seems to have finished. More the 25 armed terrorists killed, multiple armament storage and production sites hit. 4:47 PM Sorry for the lack of posting, been a busy day. 60+ rockets have fallen so far today, Tzfat, Chatzor, Carmiel, Kiryat Shmoneh, Yesod HaMaaleh, Nahariya, Shlomi, Upper Nazereth, Acco. Multiple wounded, doesn't seem to be any serious. 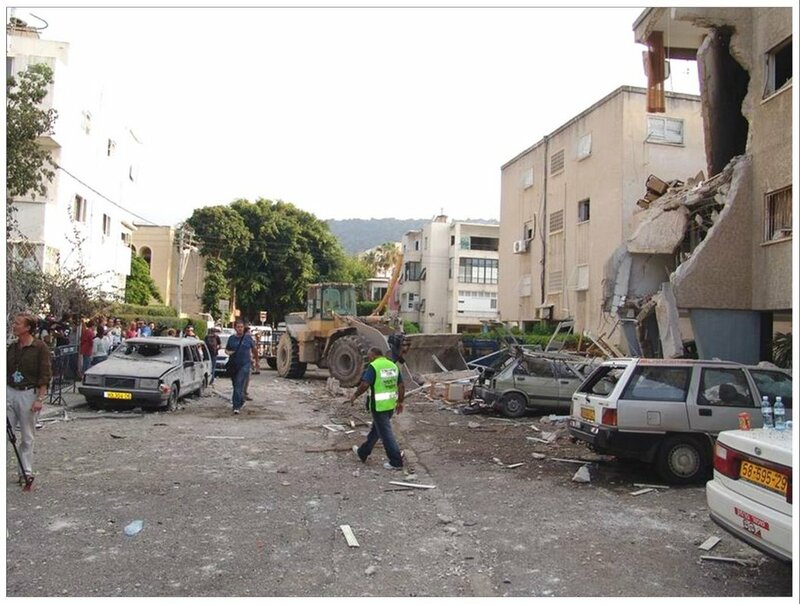 Jameel reports from Tzfat of a Katyusha hit next to the Magen David Adom station in the city. Broken windows, fire in the area, ambulances covered in dirt thrown up by the blast. 11:15 PM: 10 children wounded from a Kassam rocket that landed near Kibbutz Zikim. 2 were wounded from shrapnel, the rest from shock. The news isn't too new, but I just got in. Just wanted to wish a very quick "hi" to you all, and publically thank Litvshe and General Arafat for the amazing work they've been doing on keeping the blog going. Litvshe wrote: "Over the weekend he will be going up North to volunteer his mad paramedic skillz to those in need. His whereabouts are a closely guarded military secret. The bidding will begin at $50." Milluim was exhausting, but I took some pictures I hope to post next week. I'll bring up my camera as well for the weekend -- maybe I'll have what to take pictures of on Friday. Hopefully it will be a boring weekend, but the way things look now, I'm not so sure. Bye Everyone - catch you Sunday afternoon, B'ezrat Hashem. 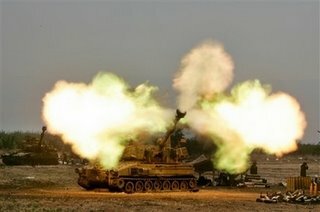 9:45 PM Anti-Tank rounds fired at soldiers active in Gaza district. 9:15 PM Round up of last 3 hours: Multiple rocket attacks in North. Kiryat Shmoneh 10, Haifa 2, more in Wester Galilee. Serveral people lightly wounded. Two border policemen wounded, one seriously when Palestinian terrorist opens fire on them in Jabal Mukhaber neighborhood of Jerusalem, terrorist killed. 3 divisions of reservists to be called up to help with the fighting in the North. Just got off the phone with Jameel. He's back on his rapid response team training. Over the weekend he will be going up North to volunteer his mad paramedic skillz to those in need. His whereabouts are a closely guarded military secret. The bidding will begin at $50. Good morning. Here's hoping today will bring better news then yesterday. 5:40 PM 16 people treated for shock in Carmiel. 5:37 PM Ismail Haniya, the Palestinian PM has called for a cease fire. They will stop Kasam attacks and hand over Gilad Shalit, if Israel stops all actions in Gaza and frees Hamas captives including cabinet ministers. 5:15 PM More rockets over Tiverya, total of 75 rockets so far today. 5:02 Israel warns Palestinians by phone to get out before houses are attacked...with direct phone calls and SMS, PA trying to stop this. 4:29 PM Cabinet has decided to call up more reserve units. 4:26 PM Sorry for the lack of posting, busy day. 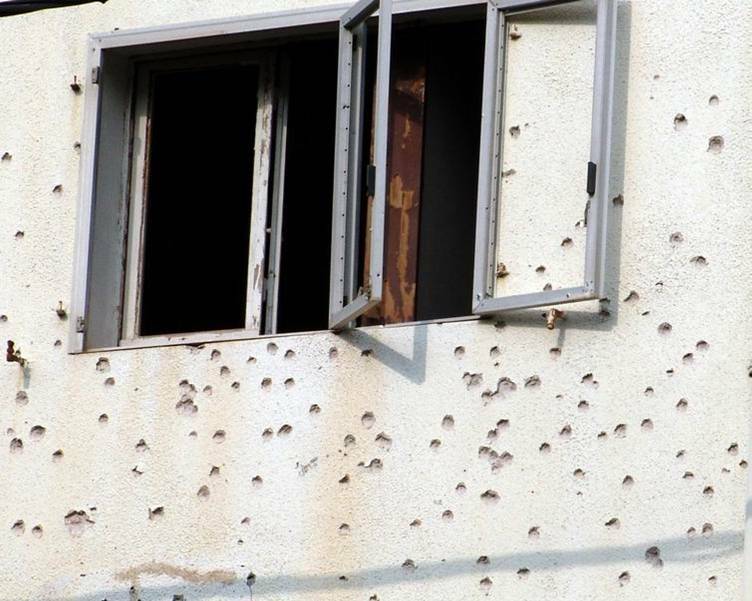 One wounded in rocket barrage in Western Galilee. Rockets fall in Carmiel. Katyushas in Naharia, 3 buildings destroyed. Property damage in Kiryat Shmoneh. 2:49 PM 2 Katyushas hit Nahariya, 1 in Rosh HaNikra. RPG shot at troops in Gaza. 1:53 PM More fighting reported in the Saj'iyah section of Gaza. At least to groups of terrorists killed, one carrying anti-tank weapons. 1:50 PM Sirens in the North. Haifa, Kiryot, Acco. 1:09 PM Palestinian sources reporting 15 wounded in Gaza City from Israeli fire. 12:19 PM Last night Hizbullah representative in the Lebanese Parliment spoke on their TV statation (Al-Manur) asking for a cease fire in Southern Lebanon. -+Litvshe comments+- In other words, their running out of ammo and need time to rearm. 11:56 AM Army still advancing in mission to take over Bint Jabaeil. 11:53 AM 24 Katyushas have fallen so far in the Galil. 1 wounded lightly. 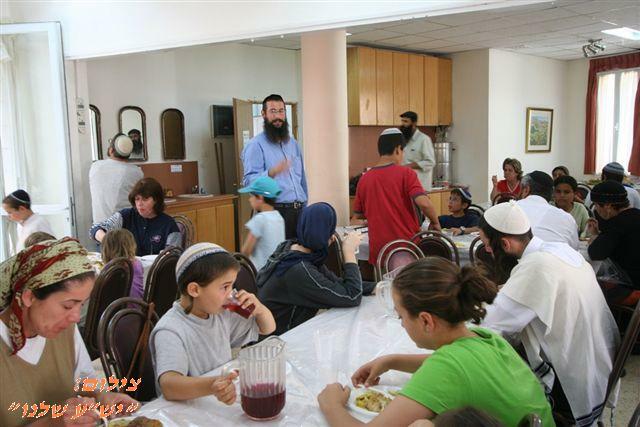 11:27 AM Pictures of families from the North being hosted by the Jewish community in Chevron. 11:01 AM Katyushas fallen around Har Chatzor, Tzfat. Sirens in Haifa. 11:00 AM I've spoken with Jameel and he will not be around until next week. He apologizes. 9:52 AM Australia pulling all it's UN related forces out of Southern Lebanon, stating International Peacekeeping Force - Suicide Mission. 9:25 AM Overnight update II: Israeli actions in Lebanon and Gaza. 3 trucks carrying armaments on the Damascus-Beirut highway attacked. 40 buildings and command centers used as cover for Hizbullah terrorists as well as armament storage struck by air raids. 3 rocket launchers taken out. Additional roads and bridges used to transport rockets and ammunition also struck. 23 Palestinians killed in fighting in Gaza. 9:15 AM Overnight update: 9 Israeli soldiers killed in fighting yesterday. 8 in Bint Jabaeil, Corporal Ohad Kleisner, 20, of Bet Horon, Lt. Alex Shwartzman, 24, of Acre (Akko), Corporal Shimon Edga, 21, of Kiryat Gat, Sgt. Shimon Dahan, 20, of Ashdod, Corporal Asaf Namar, 27, of Kiryat Yam, Major Royie Klein, 31, of the Samarian community of Eli, Lt. Amichai Merchavia, 24, of Eli and Sgt. Edan Cohen, 21, of Jaffa. Lt. Yiftah Shrier, 21, of Haifa was killed in a seperate fight in Maroun A Ra'as. May there memories be a blessing and may Hashem exact his revenge on the spilling of their blood. Katusha rockets have fallen in Tzfat, Ma'alot and Shlomi in the last hour, as well as Kasamim in Sderot and the Western Negev. No reports of injuries. Reports of a new terror threat in the Shomron. Rapid Response teams have been mobilized in many settlements. Jameel will not be getting any sleep tonight. Bone-Crusher is riding shotgun, keeping the Muqata safe. 11:35 PM: The military censor has removed the blackout on the news that another Israeli soldier was killed in the second clash with Hezbollah today. That brings the total of IDF soldiers killed today to 9. An additional 3 soldiers were wounded (not 5 as previously reported). 8:50 PM: Katyusha rockets hit Tzfat. No reports of injuries. 8:35 PM: Number of casualties in the second clash today rises to 6. 8:27 PM: Censorship lifted: 8 Soldiers הי"ד were killed in the fighting this morning in Bint Jbeil. 3 more were seriously injured - 19 more injured lightly/moderately. 8:21 PM: 10 Katyushas in Maalot (no injuries), bringing up the number to 50 for the day in Maalot; over 100 throughout the North. 8:20 PM: Update from Jameel - the information about the capture of the terrorist is not 100% - it is still being verified. 7:45 PM: The terror alert in the Sharon region has been downgraded - it seems the terrorist was captured. May we all merit to see the Beis HaMikdash rebuilt speedily in our days. Note: I've removed reports about soldiers being killed. The reports are unconfirmed and due to requests from the IDF the sites where I've gotten my information have removed some of the posts. I will only post confirmed stories on the matter. 6:36 PM I will be take a break for a couple hours, the Shav Shmaitsa awaits. 5:55 PM Official report from IDF: Wounded - 3 serious, 4 moderate, 15 lightly. 5:34 PM 3 Kasamim North Western Negev region. 5:27 PM 2 more Katyushas fall on Kiryat Shmonah. 5:25 PM Heavy damage to electrical grid in North. 5:08 PM 55 people treated by Magen David Adom due to rocket attacks. 5:00 PM Jameel's training exercises have been cancelled because of terror warnings, no more training, their in action because of terror warnigns in the area. 4:58 PM Arutz 10 reporting 28 wounded. 22 arrived at Rambam in Haifa, 2 in serious condition. 4:55 PM All wounded have been evacuated from Bint Jabaeil. 4:48 PM Foreign news sources are (Reuters, AP) are quoting Al-Jazeera and other Arab news services are reporting 9-12 soldiers killed. Hizbullah fighting from inside a Mosque. 4:17 PM Breaking news from Jameel. Extremely high terror alerts in Sharon region. Roads closed across the area. Be careful out there. 4:15 PM 98 Katyushas fired today into N. Israel. 18 wounded, 1 seriously. 3:53 PM Rockets in Kiryat Shmoneh, no injuries. 3:15 PM More then 70 rockets shot into North today. 2:44 PM 3 more kasam rockets shot over Netiv HaAsarah. The news out of Bint Jabaeil sounds bad. 2:20 PM At least 30 confirmed wounded in battle for Bint Jabaeil. 17 brought into Rambam hostpital in Haifa. UPDATE: Channel 10 news reporting of 17 brought in, 3 with medium wounds, currently in operating rooms. 14 wounded lightly. 1:41 PM House hit by katyusha in Chatzor HaGlilit. 1:33 PM Katyusha falls in area of Yesod HaMa'aleh. Possible wounded, Magen David Adom checking the area. 1:27 PM Rocket attack on Kiryat Shmoneh, number of wounded unknown. 1:26 PM Mubarek of Egypt: We won't start up with Israel for Lebanon's sake. 1:25 PM 200 Hizbullah terrorists holed up in Bint Jabaeil. 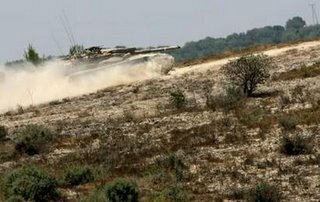 12:58 PM In action on the Southern front: Land forces in Gaza in Sajiyah have killed upwards of 15 terrorists and wounded an additional 40. Both Armored and Infantry groups are taking part. 12:06 PM One lightly wounded from rocket attack in Tzfat that scored a direct hit on house. 11:52 AM UNCONFIRMED (but from seperate sources) 8-10 soldiers critically wounded. 11:45 AM Jameel has been sighted running around in the sun with flak jacked with ceramic inserts. And shooting. He sends regards. 11:39 AM UNCONFIRMED! Heavy fighting around Bit Jbaeil - 25 wounded unable to be evacuated. Possible deaths. Will update when more information is known. 11:38 AM Rockets in Amukah and Gush Chalav. 3 lightly wounded. 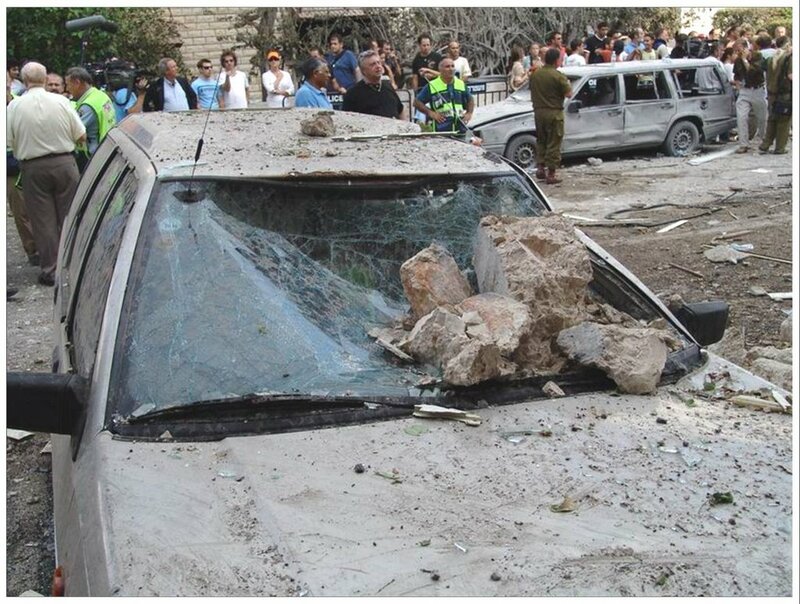 10:25 AM Rocket hits car in Haifa, at least one injured seriously. 10:22 AM More rockets fired at Ashkelon no injuries or damage reported. 10:15 AM Explosions heard around Kiryat Bialik near Haifa. 10:04 AM It's becoming clear that Hizbullah was not expecting such a strong reaction from Israel. Israel to react so strongly to its capture of two Israeli soldiers. Mahmoud Komati, deputy chief of Hezbollah's political arm, also told The Associated Press in an interview that his group will not lay down arms. "The truth is — let me say this clearly — we didn't even expect (this) response.... that (Israel) would exploit this operation for this big war against us," said Komati. 09:58 AM Army Radio is reporting that Nasrallah is hiding out in a bunker under the Iranian Embassy. UPDATE: Iranian Foriegn Ministry has denied this. 09:45 AM Some great pictures from the front lines. 09:34 AM Hizbullah counterfitting operation destroyed. Best of the Web reports what looks like uncut sheets of counterfiet $100 bills in the ruins of Sidon financial district. 09:11 AM Confirmation of soldier killed in action in S. Lebanon. 6 injured in katuysha attack on Tzfat. 09:00 AM Kol Yisrael reports 16 Palestinians wounded in fighting in Gaza. Palestinian sources claiming 30 wounded, 7 killed. UPDATE: Confirmed 9 terrorists killed. 08:24 AM Nasrallah threating to attack Central Israel. 07:58 AM Unconfirmed report of one soldier killed and five wounded in fight with Hizbullah. 06:25 AM - Ma'ariv reports Katyushot over Teveriya. No injuries. Well, it's getting late and I should really get to sleep earlier tonight, since I'll be running around all day tomorrow in the hot sun. The milluim I have scheduled tomorrow is not part of the current war, and was scheduled a few months ago, as part of keeping our CTU in shape. I'd like to thank my 2 friends who volunteered to help with keeping the news reports going till I get back. I hope to blog a bit Wednesday evening when I get home, and then on Thursday evening as well. Friday...well, I'll know for sure tomorrow where I'll be on Friday, and I'll post it )and bring my camera). 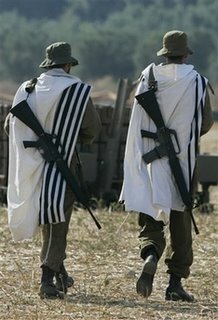 Let's hope the coming days are quieter for Israel, we get our soldiers back quickly and in good shape, and that our enemies quake in fear from us -- so they won't think of ever trying anything like this again. Jameel will be off in a few short hours to do his bit to protect the lives of the rest of us in Israel. He's asked me to help keep the home fires burning here at the Muqata. I'll try not to burn it down and make a valiant attempt to keep up with his hectic pace of live blogging. Wherever I am, my blog should be discussing minutae of Talmudic logic, rather then paying attention to the news. 11:05 Good News from the Front! 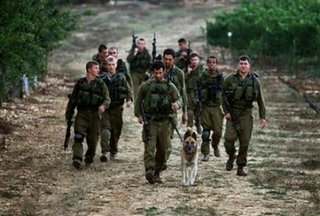 On Israel TV, Channel 2 News, Reporter Roni Daniel reported this evening: Over 200 Hizbolla terrorists killed so far, many wounded and in custody of IDF. Rumors in Lebanon show Hizbolla ordering their terrorists not to fight direct confrontations with the IDF, in light of their massive losses. 11:00 PM Another video...youve got to stand for something. In Russia she served in the Red Army. In Israel, Dr. Marina, the only female soldier in Lebanon, takes care of injured under fire. One of the doctors who evacuated wounded IDF soldiers from Bint Jbeil on Monday is also the first female soldier to serve in Lebanon: Lt. Dr. Marina of the 52nd armored battalion. Read it all here on YNETNEWS. 10:50 PM IDF apprehends two rock throwing Palestinians by the Northern Efrat intersection on Road 60. 10:36 PM Pollution in Haifa down! Exclusive information from the Muqata's own Weather Scientist, Faiga. Pollution is down about 50% since rockets started to hit Haifa -- due to chemical industry disruption and less traffic. 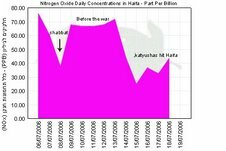 The graph shows Nitrogen Oxide concentrations (a pollutant resulting from road traffic and energy production) in Haifa before and during the war. 10:12 PM YNET reports that over 104 rockets were fired today at Israel. 10:00 PM Three IDF soldiers wounded in Lebanon -- being airlifted to Rambam hospital in Haifa. 6:12 PM Steg the blogger describes his Shabbat experience at the Muqata. Going home now...be back soon. 6:07 PM Upcoming Pro-Israel Rally in Germany! Berlin (28. July 2006 at 17:00). 5:50 PM Barrage of Rockets strike Haifa. MDA responding. 5:37 PM Appears a Hizbolla Weapons/Ammunition bunker in Beirut has exploded. Unsure if caused by IAF. 5:23 PM Dreaking News: Massive Explosions Reported in Beirut. More info to come. 4:57 PM: Anne Frank 2006: War Diaries Online. DovBear has the story and video link of Galya Daube, a 15-year-old from Haifa, Israel, who uploaded a jittery, first-person video clip last week, made as she ran through her home, rushed down whitewashed staircases and blurred her way from room to room toward the family’s bomb shelter. 4:35 PM Direct Katyusha hit on house in Shlomi...MDA responding. 4:32 PM Air Raid Sirens in Shlomi and Nahariya. 4:30 PM Sorry people...laptop problems. Seem to have been resolved. Good news - I have some volunteers to help over the next few days when I'm on milluim. 4:29 PM Name released for publication. 15 year old girl killed by Hizbolla Katyusha: Da'ah Abbas from the Marar village near Tevriya. 2:57 PM Multiple Rocket Strikes in Nahariya...reports of injuries. 2:41 PM 15 year old killed in Hizbolla rocket attack in Marar village near Tevriya. In Olmert's words -- Israel is "fighting for its right to live." -- and that's why there is now 95% support for war effort on 3 fronts in Israel. However, in a slap in the face to the country which is giving him wall to wall support, Olmert decided it's time to continue pushing his "realignment plan", and for that, I cannot remain silent. Olmert cannot expect the country to shut up, remain unified, and blindly follow every action of the Prime Minister when he starts throwing around his "realignment plan" -- and saying he will evacuate even more settlements in the West Bank. If he doesn't keep quiet, he will seriously damage the important unity that we have now. "I know that you are angry," he said. "I know that you think that you need to be in Gush Katif. We think differently. The government will invest so that each evacuee feels that the State cares about him and so that your children love the country like your grandfathers did. 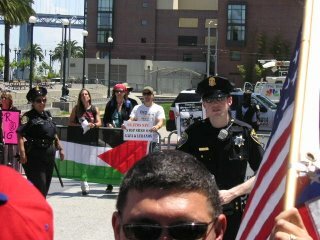 It is important to me that you know that we are acting out of the same love for Israel that you have." 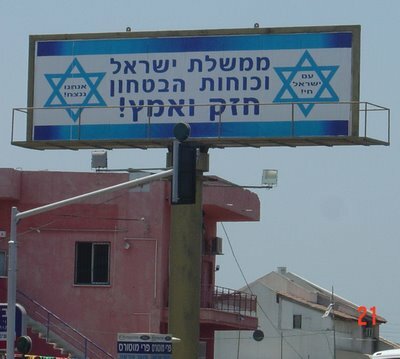 While uneployment for Gush Katif people is over 50%, teenage suicide rates are up specifically among Gush Katif teenagers -- and these people refused to run away from the Qassam rockets that hit them for 5 years...for Olmert to say that the State cares about them is a smack in the face. Olmert would be well advised to focus on the war effort instead of trying to push his realignment plan. 2:17 PM Air Raid siren a few minutes ago in Haifa...no rocket impacts reported. 2:02 PM Hizbolla Katyusha rocket lands next to a mosque in Kfar Marar (near Teverya). One wounded seriously, 2 children wounded lightly, 2 in shell shock. 1:49 PM About 20 minutes ago, another barrage of rockets landed in Tzefat and Kiryat Shmona. No injuries. 1:46 PM IAF destroys the rocket launchers responsible for this morning's attack on Haifa. IAF Black Hawk helicopter lands at Hadassa hospital in Jerusalem with wounded. This morning over 16 missiles (not katyushas) hit Haifa -- 1 serious, 1 moderate, 21 lightly wounded. 5 Katysushas hit Maalot; 2 wounded. 5 Katyushas hit Nahariya, 7 rockets fall near Meiron. Numerous fires burning around the Galil resulting from Katyusha strikes. 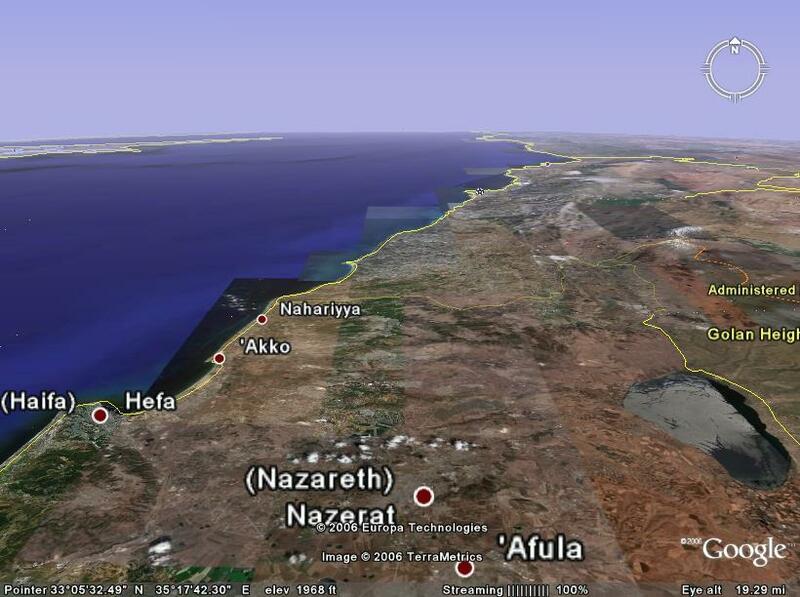 10:01 AM Rockets feel earlier this morning (about 15 minutes ago) in the proximity of Nahariya and Akko. A few minutes ago there were Air Raid sirens in Carmiel. No identified rocket landings in Carmiel. 12:12 AM A picture, and a goodnight. "Am Yisrael Chai" -- The Jewish People [continue to] Live. On the left hand side, "We Will Win"
Sorry updates were a bit sparse this evening - blogger was having a bad night as well...it took an hour just to upload this picture (perhaps Hizbolla has hijacked Blogger?). The IDF is now investigating the possibility that friendly fire may have taken down the IDF helicopter. Five of the wounded IDF soldiers were from an IAF drone's friendly fire as well. We need a better day tomorrow. A senior level officer, who was interviewed on YNET yesterday, "Magad" Oded Bisyok, was injured today while fighting in South Lebanon, losing his hand. I read the article yesterday, where he said "Nothing will stop us from continuing", and he praised his soldiers, "After the kidnapping, my soldiers immediately ran in after their friends [in their tank, into South Lebanon]...they are heroes." On my way home this evening, I stopped at a hardware store, where I found a soldier firmly talking on the phone to his wife/girlfriend, "Listen, I'm buying batteries for my flashlight now, I have to be up north in Lebanon in a few hours..." It was very surrealistic. On Wednesday and Thursday I won't be blogging at all during Israel daylight time, as I have IDF reserve duty. I'm trying to find a replacement to keep things going on the blog. 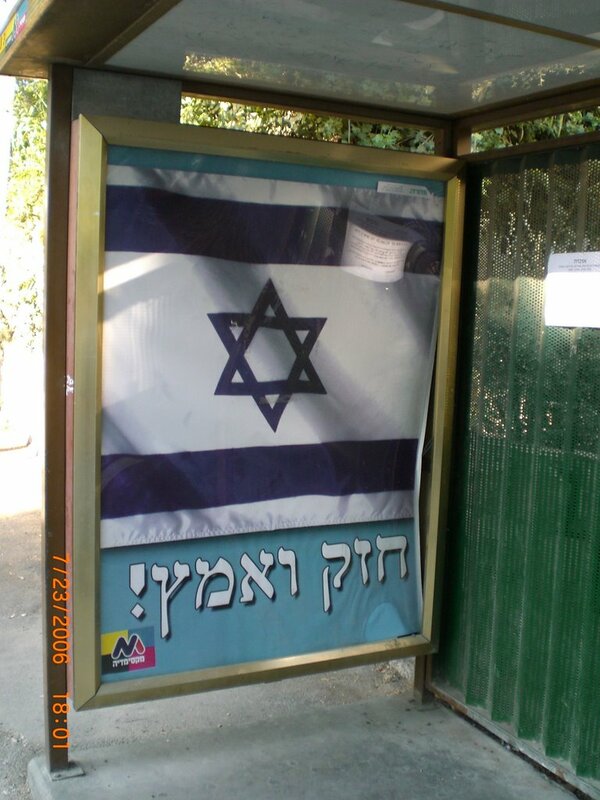 "Chazak ve'Ematz" -- Be Strong, and Be Brave -- a message to the Israeli people on a bus shelter. 10:48 PM Blogger is now working better, and Im home, and back from shiur. Updates and pictures coming very soon. 10:45 PM Katyusha lands in Central Galilee, Katyusha lnads in Kibbutz Dovev. 1. 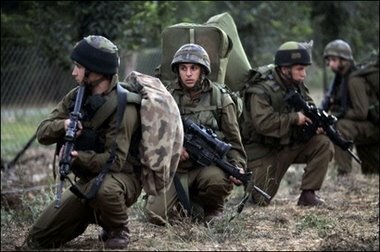 IDF officer and Soldier killed in battle this morning in Bint Jebail, South Lebanon and 16 wounded (2 serious, 5 moderate, 9 light). Mostly by friendly-fire. 2. The 2 pilots in the Apache Helicoper that crashed near Tzefat today, died. 5:54 PM Blogger Technical Issues causing infrequent updates. 2. Air Raid Sirens sounding in Meiron, Tzefat, and Chatzor. 5:38 PM 17 wounded in past hour's rocket attacks up North. 11 are shell-shocked, 2 serious, the rest moderate-light. 4:38 PM Direct hit on home in Nahariya. No reports of wounded. Rockets now falling in Maalot as well. 4:13 PM Over 30 rockets land in Kiryat Shmona, Rockets land in Carmiel. No wounded reported in Kiryat Bialik (Haifa area) which was hit by rockets a few minutes ago. 3:55 PM Air Raid Sirens in Carmiel. 3:54 PM Air Raid Sirens throughout the Haifa area. All Northern residents MUST be in bomb shelters, including the Golan Heights. 3:43 PM At least ten rockets fell in Naharia at 3:00 PM. No reported injuries. 3:39 PM MDA reports one lightly wounded in the village of Shlomi (by rocket shrapnel). Additional rocket strikes in Akko. 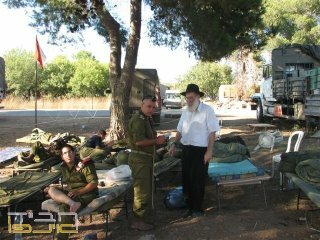 Evacuation of wounded soliders -- YNET. 3:30 PM All Northern Residents, including the Golan Heights ordered into secure bomb shelters. 2:50 PM Katyusha rockets land in Nahariya and other Northern cities. 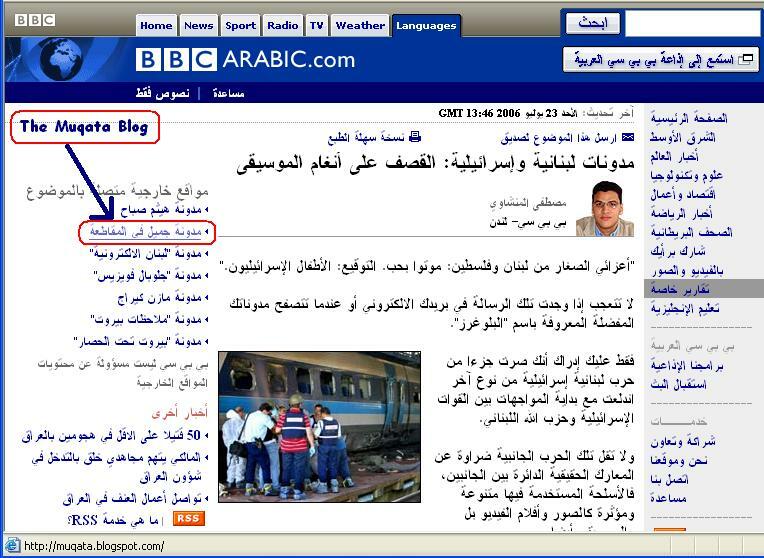 2:40 PM Historic Day for the Muqata Blog. 2:30 PM Electrical blackouts in Tzfat and surrounding areas -- result of Helicopter crash. 2:15 PM Reports of Katyusha Rockets landing in area of downed Helicopter. 1:56 PM Helicopter crash result likely result of hitting high tension power line/technical issue...Not anti aircraft fire or Katyusha rocket. 1:42 PM IDF declares Metulla, "Closed Military Zone" and orders residents to leave in light of intelligence information. 1:38 PM Qassam Rocket lands near strategic location in Ashkelon. No reported injuries. 1:21 PM Reports of crashed IAF helicopter near Tzfat, 2 wounded, (one of them seriously) MDA, IAF Rescue forces at the scene. Unconfirmed reports of overturned IDF tank in South Lebanon near Bint Jbeil. (courtesy of Reuveini-Pridan IPG advertisers). 12:06 PM Dan Halutz, IDF Chief of Staff says that IDF has photographic proof of Hizbolla rockets that can hit Tel Aviv and central Israel. 12:00 PM Rafi G. in JBlogger "face off with a Lebanese blogger, Mustafa. 10:56 AM Air Raid Sirens a few minutes ago in Kiryat Shmona...no rockets reported landing. 10:52 AM After 12 days of fighting, Israel has 37 casualties. 19 soldiers, 18 civilians. 1. (Finally) The Israeli government announces that Haifa and the Northern communities are in a "matzav cheirum" (emergency war situation). This allows for much needed financial benefits for workers and companies. 2. Ariel Sharon's medical condition takes a turn for the worse, as reported by the Tel HaShomer medical center this evening. His kidneys are not functioning as well as they should, and their is fluid building up in his body. Family members dismissed the pessimistic reports from the hospital and said there is no change that they are aware of. 3. Olmert Informs the French Foreign Minister: There are over 1 millions Israelis in bomb shelters now. 4. Over 5000 Duman of forest near Kiryat Shmona were burned and destroyed as a result of Katyusha induced fires. That's it -- Im off to bed. 6:20 PM Air Raid Sirens in Haifa, Krayot and Western Gailil. Muqata going off line for a few hours now. Be back soon. 6:02 PM Four more rockets land in Sderot -- no injuries, no damage. 10 Qassam rockets have been fired at Southern Israel today from Gaza. 5:30 PM Northern Israel under major barrage of rockets. Rockets landing Haifa, Carmiel and Akko. Direct hit on house in Haifa. gas fire erupts by now under control by Haifa firefighters. Two lightly wounded reported. 4:52 PM Picture from Jerusalem. May you come home safely. 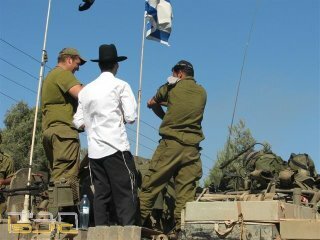 4:35 PM IDF radio reports that reservists with background in Military Civil Administration are being drafted in small numbers. This indicates the possibility of the IDF planning to administer South Lebanon for a limited time using a Military Civil Administration. 4:05 PM IDF radio reports that over 100 rockets fired in the past 2 hours at the North. 3:19 PM Reports of rockets also landing in Carmiel and Akko. Three lightly wounded in Kiryat Shmona. 3:16 PM Reports of direct Katyusha hits on homes in Kiryat Shmona and Akko. Rockets reported landing in Tzefat as well. MDA responding. 3:08 PM Air Raid Sirens continuing in Tzverya, Carmiel, Akko, Afula, Achihud, Chatzor, Machanayim, and Natzrat. 3:05 PM Air Raid sirens in the North. Rockets land in the area of Haifa and the Krayot. MDA responding. 2:59 PM Newsflash: Binyamina Residents advised by IDF Homefront Command to be in close proximity to secure rooms/locations. 2:35 PM Israel's firefighters are battling numerous fires in the North, started by Katyusha strikes. Perhaps someone should lodge a complaint with GreenPeace? 2:27 PM Uh Oh...Iran’s Ahmadinejad tells Israel to “pack up’ and leave. TEHERAN - Iranian President Mahmoud Ahmadinejad called Sunday for Israel to “pack up” and move somewhere outside the Middle East, the state news agency IRNA reported. Wow...relocate to elsewhere on the planet? Impressive. Though I'm not really shaking in my boots. 2:22 PM Neighbor's son who completed 3 years of IDF service and was discharged last Monday, received emergency call up orders on Friday. He's painting his face green and going up to Lebanon today...We wish him a safe and successful mission! Torah.org, is launching a new "Pray for Israel" campaign to get people praying and learning for the ill and injured, by getting people onto it's mailing lists ("Lifeline" for learning links, and "Cholim" for prayers). 12:57 PM One katyusha rocket landed earlier on a house in Haifa. The residents were in their bomb shelter and emerged unscathed. -- Worried about the situation in Israel? -- Concerned that you don't have all the facts? -- Wondering what you can possibly do from here? The answer is SIMPLE. THIS SUNDAY is your opportunity. Take a few hoursout of your day andJOIN the entire BAY AREA COMMUNITY as we STAND AGAINST TERRORISM and STANDWITH ISRAEL.The time is NOW and your attendance at the event really can sway publicopinion. Please SPREAD THE WORD to all your lists, sites andorganizations! 12:16 PM Pictures of cows who were hurt in Katyusha rocket attacks in the Galil last week. Viewer Discretion is seriously advised. More Pictures here. 12:14 PM Air Raid sirens in Haifa and Akko...No confirmed rocket hits. 12:10 PM FALSE ALARM -- Air Raid Sirens which were head in Binyamina and Zichron Yaakov a few minutes ago were false alarms. 12:05 PM One of the killed was from a direct Katyusha hit on a car in Haifa driving to Nesher. 12 wounded, 1 serious, 1 moderate. 11:17 AM MDA reports that there are 2 dead and 3 in serious condition from the rocket attacks on Haifa and the surrounding areas a few minutes ago. 11:11 AM Reports of 1 dead and several wounded in this morning's rocket attack on Haifa. 8:30 AM This morning, Katuyusha rockets lande in Western Galilee - no injuries, no damage. Following a day of uncertainty, the army located the body of a fallen soldier from the Egoz unit who was killed during battles against Hizbullah Thursday in the southern Lebanese village of Marun a-Ras. His name has not yet been released for publication, as he is a ‘lone soldier’ who immigrated to Israel without his family and joined the army on his own initiative. Thus, the number of IDF casualties in the battle has risen to five. Six more soldiers were wounded in the fighting. 8:27 AM Good Morning Blogworld. Quick news roundup before running to work. Shavua Tov...A good week to us all. Unfortunately, Northern Israel had a hell of a shabbat, with over 150 Katuysha rockets landing all over the place. Nahariya got 25 rockets, Kiryat Shmona got 28 rockets...and in total there were 3 wounded seriously and about 30 wounded all together. In Maalot today, a Magen David Adom ambulance crew delievered a baby, and then, under rocket fire, transported the mother and newborn to the hospital in Nahayira. Tonight in Tel-Aviv, thousands of Israeli Leftists demonstrated against Israel's response in South Lebanon. 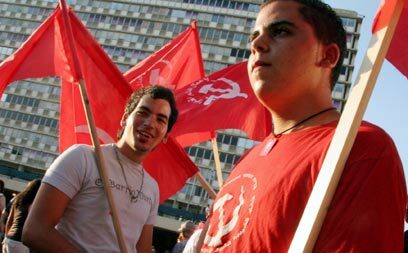 Wearing communist Soviet Sickle and Hammer shirts, the demonstrators urged IDF soldiers not to take part in the Lebanon operation, chanting: "Listen up, soldier – it's your duty to refuse." 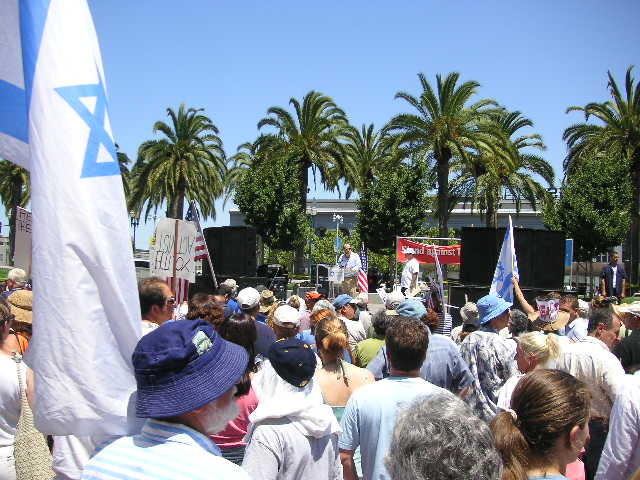 Other slogans recited by the participants were: "The occupation is a disaster, leave Lebanon now," "Olmert and Bush have struck a deal – to carry on with the occupation," and "Children in Beirut and Haifa want to go on living." May these people have a speedy recovery soon. Attention crazy super-rightwing friend from college who always called me a "pinko leftist commie". This is what REAL communists look like. Fatah's "Al Aksa Military Brigades" announce that if Israel expands it's war in Lebanon, they will attack the Ben Gurion airport. 6:25 PM Heyall, this is Steg (dos iz nit der šteg). I am staying by Jameel at the Muqāŧ‘ä for Shabbos, and just jumped on the computer to pass on Jameel's apologies for the lack of updates. Do to logistical concerns, things have been a bit busy around here. Expect more updates after Shabbat. Shabbat shalom! 3:26 PM Update from Katyusha attacks: Direct hit on Amirim School in Kiryat Yam (Haifa area). Total number of wounded in Haifa area climbs to 19. 3:23 PM IDF calls up 5000 additional reservists via "Tzav 8" emergency call up orders. 15 wounded in Haifa in 4 rocekt strikes. The 2 seriously wounded are now classified as moderately wounded. 1:55 PMKatyusha Rockets strike all over Israel's Northern Region. Located rocket strikes in Haifa, Krayot, Rosh Pina, Akko, Tiverya, Nahariya and Kiryat Shmona. 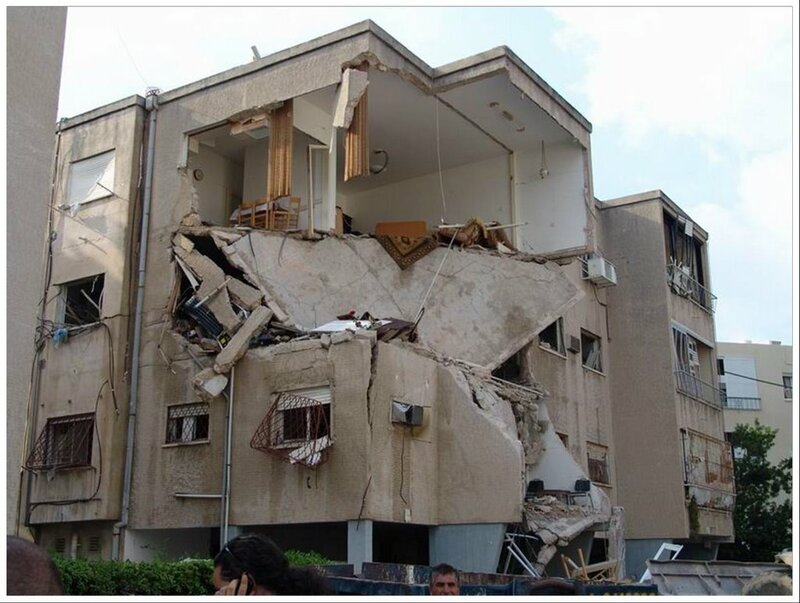 Direct hit on building in Haifa with 6 wounded; two in serious condition. 12:00 PM Taking a break for a bit...off to take pictures around Central Israel. Israel is at it's patriotic best. 11:46 AM Remember the chase for the suicide bomber on Wedneday around Kfar Sava and Hod HaSharon (near the mall) which I blogged about? Here's a picture of the would be bomber. Great work by Israel's police, Shabak and IDF for catching this guy before self-exploding, and possibly causing a catastrophic attack. 11:45 AM Reports of many hundreds of IDF soldiers operating in South Lebanon. Hizbolla rocket, aimed at Israel, misses..and hits a UN outpost in South Lebanon. After 11 months of living in a tent encampment in Kibbutz Yad Mordechai, residents of the evacuated Gaza Strip settlement of Elei Sinai on Thursday evening began disassembling their tents and held a farewell ceremony before moving to yet another temporary housing in Ashkelon. According to the original plan, Elei Sinai evacuees were meant to settle in Kibbutz Palmahim, but after several months of struggle they were no accepted by the majority in Palmahim, and the Disengagement Authority is now looking into other options for them. 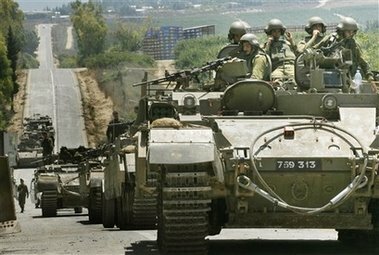 11:03 AM Channel 10- TV reports that hundreds of IDF soldiers are now operating in South Lebanon. Names of 3 IDF soldiers killed last night near Avivim cleared for publication: Major Benjamin Hillman, 27, of Raanana; Staff Sergeant Rafan-el Muskal, 21, of Mazkeret Batya; and Staff Sergeant Nadav Balua, 21, of Carmiel. Read here from wikipedia for some info about the Apache Attack Helicoper. 12:40 AM I'm going to bed - signing off now. Reporting tomorrow (Friday) will be less than usual because it's erev shabbat. A quiet shabbat to us all. 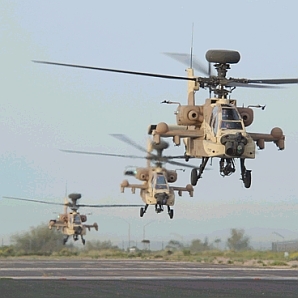 Reports of 2 soldiers killed in helicopter crash. Unconfirmed reports as well of IDF casulties near Avivim. I'm not staying up now to sustantiate the reports now...they should be on YNETnews soon. 12:22 AM Unconfirmed reports of TWO IAF helicopters colliding in Israel near Ramot Naftali (in Israel, not South Lebanon). Reports say it was a collision of the 2 helicopters and they were NOT shot down as Hizbolla is claiming. 11:30 PM Israel TV (CH10) reports that the interview with Nasralla was not live on Al-Jazeera, but previously recorded. 10:52 PM Sirens heard in the Western Galilee. Four Katyusha rockets land in Rosh Pina. No Injuries. Rumor from Lebanon that Nasralla will make a TV appearance this evening. 10:50 PM Some pictures of Katyusha damage to Haifa (click picture for full screen) More pictures coming soon. 10:18 PM Released for publication by military censor. Some of the terrorists arrested yesterday at the Palestinian Authority Muqata in Shechem, were working for Hizbolla. 9:38 PM Lots to post, but have to run to shiur. Eilat Hotels at 100% capacity, due to influx of guest from the North. The IDF checkpoint at the Northern entrance to Eilat had a 7 kilometer traffic jam, as thousands of people flock to Eilat. Hotel occupancy in the North is at an all time low. Intense Firefight continues up North on the border near Avivim. IDF troops kill at least 10 Hizbolla terrorists, while the IDF has some wounded and casulties reported. Check back around 10:45 PM, Israel time -- as I have lots of pictures to post. 6:06 PM Reports of 6 wounded IDF soldiers in ongoing firefight near Avivim. 6:03 PM Rockets landing everywhere up North. Sirens sounding in Chatzor, Tzfat, Avivim, Akko, Carmiel. Heavy fighting near Avivim. 5:49 PM A few minutes ago, Katyusha Rockets fell in the Upper Galilee. No damage or injuries. At the launch of rockets directed against said areas of residence, a siren will sound. 1. If indoors: immediately enter a secure space or an interior room with as few openings, windows and exterior walls as possible. 2. If outdoors: enter a stairwell of a building or assume a prone position next to the nearest wall or other shelter. 5:40 PM Funeral time announced for fallen IDF soldier Yotam Gilboa -- Friday, 10:45 AM, Kibbutz Maoz Chaim. Yotam was also a volunteer EMT for MDA. 5:36 PM Firefights between IDF and Hizbolla continue to rage on Israel's northern border. 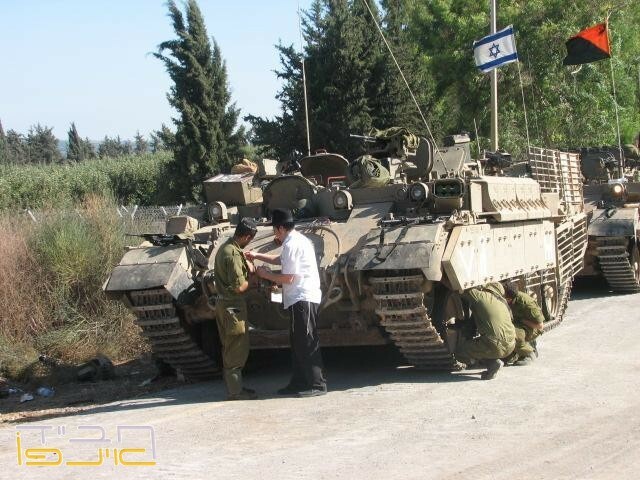 3:24 PM Israeli IDF tank soldiers prepare for mission on Israel's Northern Border. Tefillat HaDerech/Prayer for a safe journey, recited in their tank. The soldier reads off the prayer from a card connected to is dog tag. Kudos to Oleh Yashan for the video editing. 3:15 PM "Red Dawn" system activated in Ashkelon..incoming Qassam rocket. 3:00 PM In previous firefight today near Moshav Avivim -- 3 Hizbolla terrorists killed by IDF. One person lightly wounded by Qassam strike in Southern Israel. IDF Chief of Staff says war may take a long time. After warning South Lebanese to move northwards, the IDF dumps leaflets on Gaza warning residents that any home with weapons in it, is liable to get destroyed. 1:43 PM No missile strikes in Haifa or surrounding areas. 1:32 PM 230 New Olim arrived in Israel this morning from North America through Nefesh B'Nefesh. Welcome Home -- Ken Yirbu! 1:30 PM Air Raid sirens in Hafia and Nahariya -- no reports of Katysuha hits. 1:15 PM Qassam strike in fields of Kibbutz Nir Am (Southern Israel) -- fire breaks out as a result. 12:55 PM Geographically Challenged? You read Muqata updates about all these places around Israel and Lebabon, but you have no clue where they really are. Is Avivim North or South...and is Tzomet Amiad in the east or west of the Galil...and where is Maalot? How far is Sderot from Gaza...? We at the Muqata understand...and will be now introducing a feature...the war in maps. 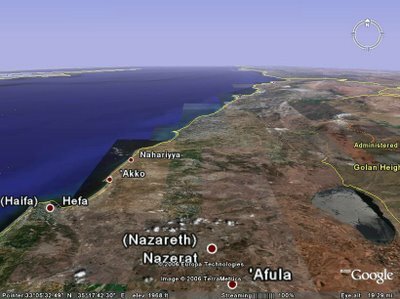 Using GoogleEarth technology, we'll help pinpoint the different locations in Israel (and Lebanon as well) to help acquaint you with the locations in the news. 12:44 PM Qassam Rockets Landing in Sderot. 11:31 AM Fierce fighting around the Northern Border between IDF soldiers and Hizbolla. CNN reports that US Marines have arrived in Lebanon to assist in evacuating American citizens who wish to leave. 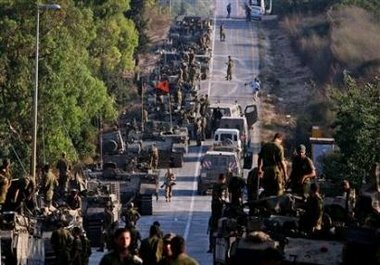 IDF radio reports that many South Lebanese are leaving their homes and going north in accordance to IDF instructions. 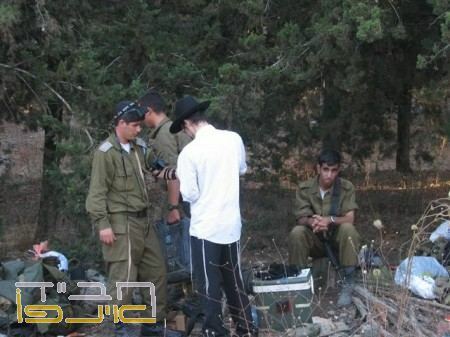 Katyushas all over the north...3 IDF soldiers wounded in fighting 1 serious, 2 moderately. 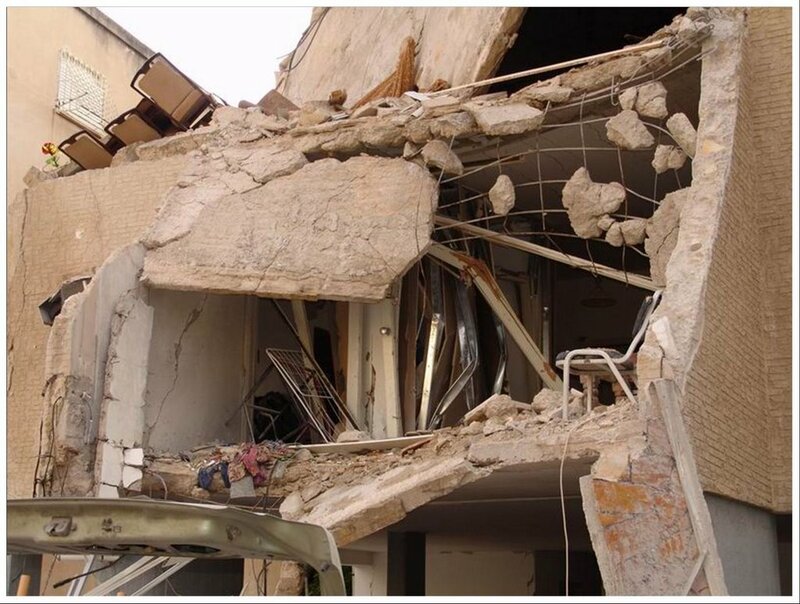 Still no word on Nasralla after Israel's bombing of a Hizbolla bunker late last night in Beirut. 11:04 AM Rocket Landed near Tzomet Amiad, no damage, no injuries. 10:48 AM Senior IDF artillery commander tells YNET: We have already shot over 10,000 shells at terrorist targets in South Lebanon over the past week. 10:21 AM Rockets feel a few minutes ago in Tverya and Carmiel. 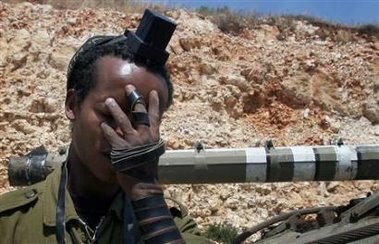 10:05 AM Earlier this morning, 2 Qassam rockets fired at Sderot; 2 lightly wounded, and 2 Qassam rockets fired at Negev Kibbutzim. Not damage or injuries. Ari Raid sirens heard in Haifa, but no Katyushas landed. 10:03 AM Good Morning - going to be a busy day today with updates more hourly than by the minute.